As you know this method means when you are at the customers house, you are measuring everything with either a tape or a electronic measuring device. The electronic tape's are pretty cool as you just have to point and press a button. Anyway, what you are trying to do is get the surface area, length or the quantity of the areas or items you are about to estimate on. This program comes with a few examples but it does not have a huge list like some other programs. The reason why is everybody has different rates and I don't even want to guess what yours are. I'm sure you have seen Online or someone at the paint store has asked what your price rates are for stuff, when this is really a bad question as what they should be asking is how much can you get done in a specific time frame. For example how long does it take you to roll 100 sq-ft of textured walls instead of how much do you charge for 100 sq-ft of textured walls. This program comes with what I believe is pretty unique feature and that's the Rate Recorder. The way this works is lets say you have a job where one of the things you have to do is prime 200 feet of 2x8 fascia board. All you have to do prior to starting, is to jot down the time and start priming. Once you are done, take a note of the time and how much primer you have used. Now when you get home just simply start the program and get to the add rate form and follow the steps. Click get my rate and there you have it. Your rate for priming 2x8 fascia board. You can even add a picture of this fascia board so in the future you can compare this fascia with the one you are biding on just to make sure this rate will apply and be accurate. The neat thing about the rate recorder is it counts dead time, setup time, and bathroom breaks. You also can choose several different primers or finish paints. Add costs for initial setup time, like rollers, thinner and other items. You might find that you won't be able to do this on every job, but after awhile if you keep recording stuff you will have a real nice list of production rates for your company. The production rates form pops up and should look something like this. Just click on the image to view a larger version of it. For the most part, this form is self explanatory. The level drop down box increases the price by 10% per point. You can round the gallons up to the nearest gallon, quart or the exact decimal. If you are using multiple rates, then you should use the exact decimal method, then round up at the end. Also there is a section "Adjust Coats" where you can modify the time and materials by the number of coats you are using. Typically for me when I'm putting on the second coat it usually only takes about 2/3 of the materials and about the same in labor. A little less as each coat gets put on. If you added a picture for this item when you first set it up, it will be displayed on this form right below the description drop down box. This is kind of nice as it gives you a visual of what you are estimating on. Hopefully the windows you are biding on look similar to the one in the picture as this was the window where this rate originated from. Also you can double click it to get a larger view. After you get your rates for this area or room, just give it a name and click finish. 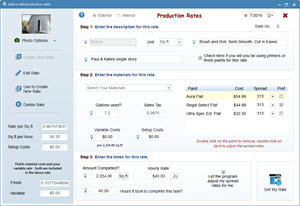 This will now add these prices in a single row in the main grid of the estimating form. 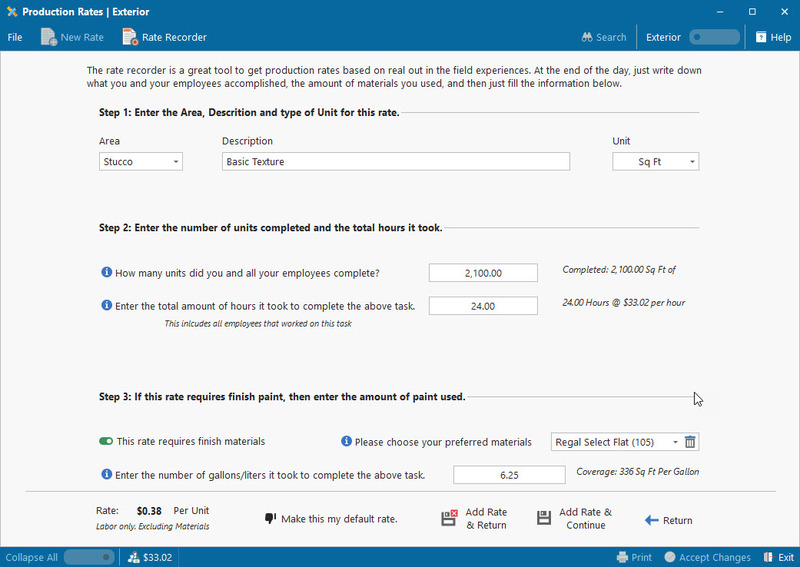 To edit the rates just click the button that you used to create the rate. "S" for the single rates form or "A" for the area rate form. So with a little goofing around I'm sure you will get the hang of things.